1965 : Baron V. Schwalm (Bud) p urchases his first car…a Model "A" Ford Tudor. Little did he realize how much this purchase would influence his life. 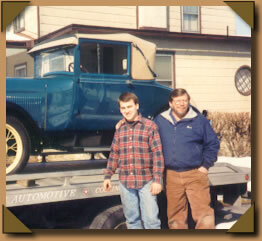 Shortly after purchasing the car, Bud had the engine rebuilt. However, he did not have much time to enjoy his investment because he enlisted in the U.S. Army and left for boot camp in January 1966. 1968 : One of the first things Bud did when he returned home from the U.S. Army was start up his old "Henry." However, to his dismay, he heard a funny knocking sound from the rear main bearing. After only two years, most of which was spent sitting in a barn, the engine needed rebuilt again. 1972 : Bud married Jan. The marriage was happy, but the Model "A", suffering from a lack of attention, continued to deteriorate! 1973 : Bud decided to rebuild the engine again. However, he had difficulty locating a machine shop that knew how to pour the babbitted bearings. After searching for several months Bud still did not have any leads. Finally, Bud decided to research babbitt and attempt to rebuilt the engine himself. After months of researching the subject Bud began to experiment. Each attempt got better until he felt confident to try it on his engine block. Each bearing was poured perfectly! 1973 : Word traveled quickly that Bud had successfully poured his own bearings. Within a matter of months, someone was knocking on Bud's door asking him if he would pour bearings for another engine. Bud tried to decline, but eventually he agreed to do the job. 1974 : Bud decided to accept his new role as a babbitt expert. During this time he also purchased some old babbitt pouring equipment to aid his new hobby. Bud's popularity continued to increase. 1977 : Soon people were asking Bud if he would rebuild entire engines. To satisfy this request the Schwalms purchased various engine rebuilding equipment. Bud's pastime was quickly becoming more than a hobby! 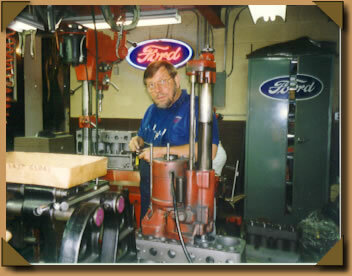 1989 : Bud decided to quit his job as a machinist and to start rebuilding model "A" engines full-time. Obviously this decision was a difficult one for both Bud and Jan. Are there enough people out there that need an old Ford engine repaired? 1991 : There were too many engines waiting to be rebuilt, so Bud decided to hire additional help. Ora Landis started to work for Schwalms full-time shortly after he finished high school. Ora was an excellent mechanic and quickly absorbed Bud's years of experience. 1995 : Bud was diagnosed with non-alcohol related cirrhosis of the liver. After a nine-month battle with the disease, Bud died in September 1995. Jan and Ora were faced with some important decisions. Should they finish the engines they were currently rebuilding and then shut down the business? Neither Jan nor Ora liked this idea, so they created an official business partnership near the end of 1995. If Jan would keep the records, Ora would rebuild the engines. 2000 : Ora and Jan were still receiving too many engines. It seems as if there are more Model "A" Fords every year! To help with the backlog of engines Schwalms hired Jeff Lefever full time. 2002 : By this time, the Model A business was outgrowing the small basement and garage facilities that had housed it from the beginning. 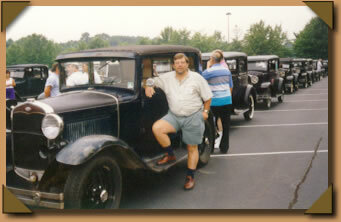 In January of 2002, the business was moved down the road to Strasburg PA. Jan also decided that this would be a good time to retire from the Model A world. She coached Oras wife, Jen, on the bookkeeping and then her half of the business was sold to Ora. 2002: In November, Ora and Jen had a baby girl, Zoe Mae Landis. With her new role as mom, Jen and Ora moved the office to their home in Strasburg, so that Jen could continue to work on the paperwork end of the business. 2004: With business still increasing, Ora and Jen added Dennis Wise to their full-time team. 2005: In March, Ora and Jen had a son, Ashton Ora Landis.